These days, the benefits of ISOBUS have been documented and reported in most of the world’s agriculture markets yet many farmers have not jumped on board with the idea. Perhaps it is the prohibitive cost, perhaps they just haven’t had the need or the desire to have the “latest and greatest” technology on their farms, or perhaps they just aren’t familiar enough with the technology to be comfortable taking that first step. Whatever the reason Agtron is happy to be a part of this innovative technology, and while our staff may be in the early stages of becoming ISOBUS experts, we think this technology is here to stay. (VT) provides the user interface, typically including a screen and keys or buttons for the displaying and entering data. The user sees various screens or Masks, on the VT for displaying and inputting data. These screens are desigend and controlled by the implement controllers, not the VT itself. ISO 11783 also sets various requirements for the screens such as minimum resolution, the shape of the main area that displays data, and the areas that can be used for user input. All of the information needed to display the screen is loaded into an Object Pool to be sent from the controller to the VT. The Tractor ECU is the interface between the implement portion of the data network and the tractor portion. Tractor ECU’s are divded into Class 1, 2 or 3 based on the functions they offer, a higher class providing all the properties of a lower class. 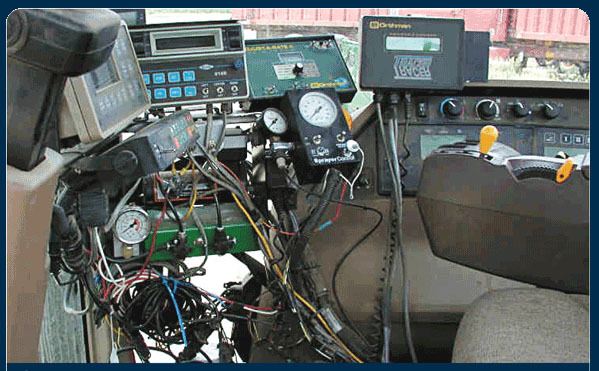 This helps the user determine if a particular implement will operate on a particular tractor. Ex. An implement requiring a Class 2 Tractor ECU will work with a Class 2 and 3 Tractor ECU, but not a Class 1 Tractor ECU.